Know about me Danielle Strait, Esq. Danielle Strait, Esq. is a complex litigation partner practicing out of the Firm's Seattle, Washington office. She focuses on representing clients across the country in complex litigation. 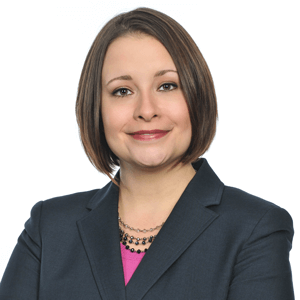 Ms. Strait joined Maglio Christopher & Toale, P.A. in 2012 and is a partner in the Firm. Before that, she spent three years serving as a federal court judicial law clerk. Ms. Strait graduated with honors from the Catholic University of America, Columbus School of Law. While at Catholic University, Ms. Strait served as the Editor-in-Chief of the Journal of Contemporary Health Law and Policy. Before serving as a federal court law clerk, Ms. Strait was employed at the Washington D.C. area firm of Decaro, Doran, Siciliano, Gallagher, and DeBlasis. While there, she worked on several high profile appellate briefs, including an appeal to Maryland's Supreme Court. Ms. Strait is admitted to practice before the courts of the State of Washington, the State of California, the District of Columbia, and the United States Court of Federal Claims. She is very active in the bar of the United States Court of Federal Claims. In 2014, Ms. Strait was appointed by Chief Judge Patricia Campbell-Smith to the Advisory Council of the Court. Ms. Strait grew up in Iowa and graduated with her bachelor's degree from Iowa State University. She's spent time living in the Midwest and on both coasts. She currently resides with her husband, sons, and their pets in Seattle, Washington.